This title features practical projects for beautiful and original cards, gift wrap, boxes, tags, envelopes and invitations for every occasion. 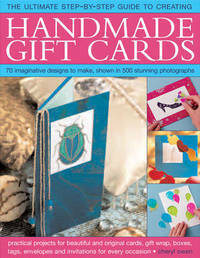 It includes 70 designs for greetings cards, gift wrap, invitations, gift boxes, gift tags and envelopes. It features 500 step-by-step photographs that show in detail how each project should look at every stage - with templates for every design and concise instructions. It contains ideas for every occasion including Valentine's Day, Halloween, Thanksgiving, Divali, Hannukah, Christmas, children's birthdays, weddings, retirement, thank you, get well, and more. It demonstrates a range of techniques - from beadwork and silk painting, to embossing metal and pressing flowers, and a whole array of papercraft techniques such as origami and decoupage. Here is the ultimate practical book of greetings cards to make, perfect for the beginner as well as more advanced crafters looking for new inspiration and techniques to add style and individuality to their own hand-crafted card designs. Featuring 70 original projects, each with a timeless quality, there are ideas for every occasion. As well as greetings cards, there are designs for personalising gift wrap, making gift tags or slimline envelopes to hold small presents, as well as gift boxes. Full instructions are given for every idea and 500 step-by-step photographs show in detail how each project should look at every stage. Whatever the occasion, a beautiful handmade card adds to the sense of occasion, and is a token to be cherished. Cheryl Owen devotes her time to a wide range of creative crafts, including paper crafts, salt dough, fabric and needlecrafts, jewellery making, and developing crafts for children. Her work regularly appears in leading homestyle magazines, such as Prima, Inspirations, Good Housekeeping and Woman and Home. She is the author of a number of books including Quick and Easy Greetings Cards (New Holland).